Dabo Guan FAcSS is a Chair Professor in Climate Change Economics at School of International Development, University of East Anglia, a Senior Member of St Edmund’s College, University of Cambridge, and a Distinguished Professor at Tsinghua University, China. He was conferred on the title of Fellow of Academy of Social Sciences, UK in March 2019. He was elected as a Fellow of Royal Geographical Society in 2018. He is the Director of Water Security Research Centre at UEA. He serves as a Subject Editor of Applied Energy (Impact Factor: 7.182 and 4 million downloads in 2018) and board editor for Nature Sustainability, One Earth and ERL. He is a council member of the Rockefeller Foundation Economic Council on Planetary Health. He served as a Lead Author for the 5th Assessment Report of Working Group III, IPCC. Dabo has published over 130 articles, including 25+ articles published in Nature, Science, PNAS and Nature research journals. His h index is 51 and has over 10,000 times citations. 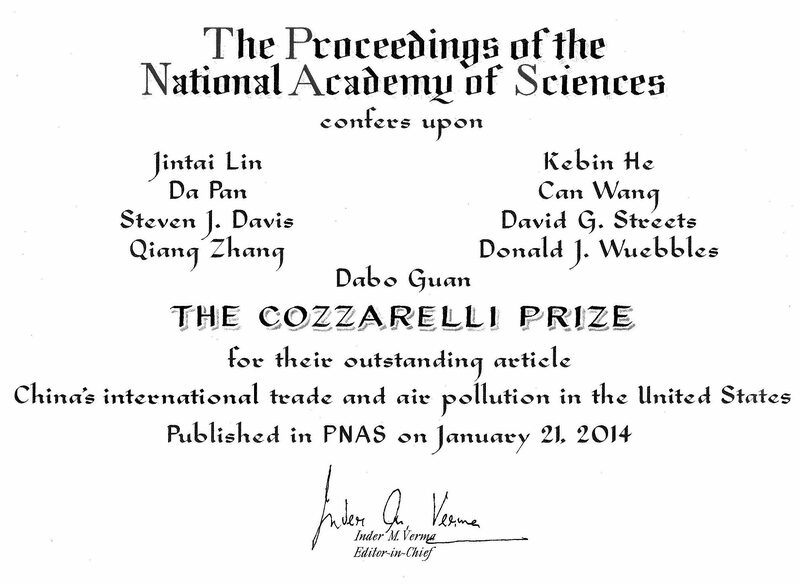 He won the Leontief Prize 3 times and my paper at Environmental Science & Technology won the "Top Policy Paper 2007" and the PNAS Cozzarelli Prize 2014. He won the Philip Leverhulme Prizes (to award outstanding scholars who have made a substantial and recognised contribution to their particular field of study, recognised at an international level). Dabo is a Highly Cited Researcher for 2018. His paper about climate change and beer drought received the 2018 Altimetric Top 100 award and was the most “talked about” climate change-related paper in media and social media. Dabo landed in the UK in 2000 and gained a BA in Environmental Management with Science in 2003 at University of Leeds. He studied further and obtained a PhD in Ecological Economics by 2007 from Leeds. Dabo spent about 5 years in Cambridge as a Postdoctoral researcher and later as a junior faculty. In between, Dabo worked for World Wild Fund (WWF) for a year as an Economist. He re-joined University of Leeds in 2011 as an Associate professor and then appointed as a Chair of climate change economics by University of East Anglia in 2014. He was conferred on the award of the Fellow of Academy of Social Sciences (FAcSS), UK in March 2019. Dabo specialises in ecological economics, international climate change mitigation policies, climate change adaption modelling, scenario analysis on environmental impacts, footprint accounting and resources management, input-output techniques and their applications in both developed and developing countries. He has been leading several international consortium projects and research fellowships funded by RUCK, Newton Fund, UK government, and National Science Research Foundation and Ministry of Science and Technology in China. See his latest papers and media reports (English / Chinese) and Google Scholar.